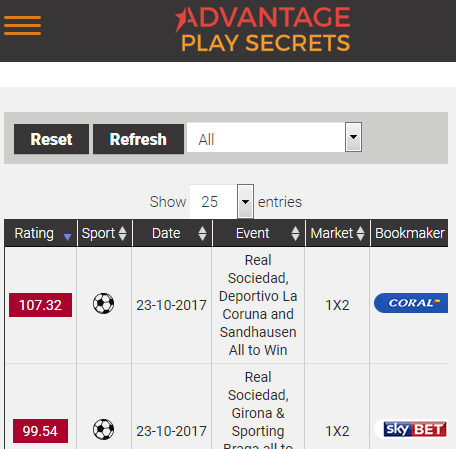 Mike seems to have done it again here with Advantage Play Secrets, which offers 4 brand new betting systems to make a profit from. Advantage Play Secrets has been launched recently. The name Mike Cruickshank might not mean a lot to most people reading this. In fact, I would not be surprised to find out that it doesn’t mean anything to a lot of people. What they may well have heard of however is the culmination of his hard work and the name that remains from his first product, Bonus Bagging. I am referring of course to matched betting. If you haven’t heard of matched betting and have an interest in gambling, welcome to the show. You’re rather late. I think that it is fair to say that matched betting is arguably one of the most important developments from a punters point of view in the last decade. The almost zero risk betting approach made a lot of people a lot of money and Mike Cruickshank has continued in this vein for some time. It has been a while since Mike Cruickshank has released an entirely new product however, so it is with a fair amount of excitement that I sit down to look at Advantage Play Secrets. This applies doubly so as I had heard some rather positive things on the grapevine about it. Truth be told, I think that whilst matched betting was an incredible thing, the bookies are getting savvier, more people are offering their take on it, more people are getting involved and the waters are slowly starting to muddy. With all of this in mind, I want to start to take a look at Advantage Play Secrets and whether or not it can deliver the same quality that I have come to expect from Mike Cruickshank. 1 What is Advantage Play Secrets? 8 So What Do I Think of Advantage Play Secrets as a Package? 9 Does Advantage Play Secrets Represent Value for Money? What is Advantage Play Secrets? Advantage Play Secrets is an entirely new product which brings together several different low risk betting strategies, each developed by Mike Cruickshank. Now I have to be upfront from the start. Using Advantage Play Secrets is not like matched betting products which you may be familiar with. 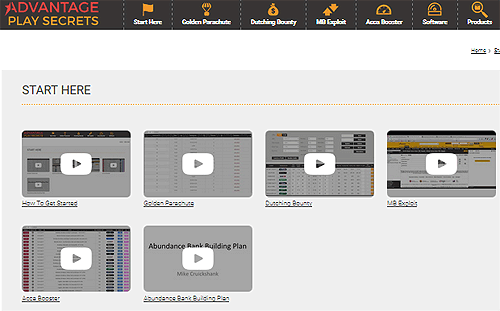 What Mike has actually done here is packaged up 4 of his very lastest income generating products, and offered them as a membership. For example, the main products in the Advantage Play Secrets product, he was offering to entice customers on another product recently, and I know for a fact that customers and new members came flocking, with the feedback on these new products being extremely positive. Therefore I suspect that this is the very reason that Mike has now decided to offer them as a package, and I cannot blame him for that. it’s almost like STEALING money from the bookies! 4 Brand new strategies you can execute back-to-back to progressively increase your earnings, and build your betting bank! A world-class Online Betting coach – watch over my shoulder as I use these strategies to place low-risk, profitable bets in REAL TIME that you can mimic. Whilst Mike Cruickshank does a very good job of explaining everything with Advantage Play Secrets, this is not the “paint by numbers” approach that you might be used to with other products. By this I mean that there is a bit of work involved. Fortunately, there are a number of tools included with Advantage Play Secrets to help you. As an overall package, Advantage Play Secrets is made up of 4 different systems, each of which I will look at in detail in their own section. What I can say now is that all 4 are actually very capable of working and ultimately making you a profit. Ultimately, you can expect very comprehensive training showing you live examples of how to bet using a given method. These are recorded by Mike Cruickshank and he talks you through the process, step by step, of what each betting strategy involves. The whole thing has clearly been designed to be user friendly and I feel like Mike Cruickshank is to be commended for this. In fact, I was able to navigate round the members area with absolutely no problems and everything did what I expected it to do. The content that is contained within Advantage Play Secrets is concise and too the point whilst Mike Cruickshank is very informative and helpful in his videos. With this in mind, I will now look at each of the different systems that comprise Advantage Play Secrets. This is recommended as the starting point of Advantage Play Secrets and I can definitely see why. Mike Cruickshank refers to it as one of his favourite beginner methods and it isn’t hard to see why. First of all, the nature of the method behind The Golden Parachute Method is incredibly straight forward. You don’t really have to have any understanding of betting to get started and in a rare but welcome move for a product aimed at those starting out betting, you don’t need to invest a lot of cash to get started. As always I am loathe to go into detail about how The Golden Parachute Method works. This is a product if Mike Cruickshank and to publish the details simply isn’t fair. Betting isn’t too difficult which is mostly down to a rather comprehensive piece of software which calculates your bets and stakes for you. 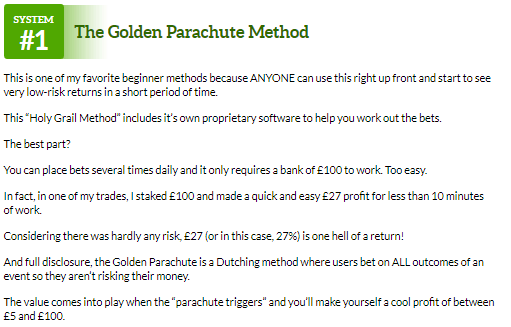 I don’t think that I am giving away anything in saying that The Golden Parachute is based around dutching and taking advantage of pricing movement from bookmakers. At this point I feel the need to point out that I have been somewhat critical of most products which claim to use this as a basis for a service. With The Golden Parachute Method however, you are not simply looking at odds and pricing movement based on a criteria of your own design. This is often the case with tipsters and frankly, it is the problem that I have with their methods. There is no verifiable way of monitoring their reason for predicting price swings outside of “I think this horse will be faster on the day”. The method that The Golden Parachute Method employs is however steeped in a very logical, almost machine like process. This means that it will work the same way every time and that is something that I always expect when looking at a betting product. Combine this with a piece of software which helps you to place your bets and calculate where your profits lie and there is little denying that this first element of Advantage Play Secrets is a winner. The Golden Parachute Method is a decent low risk system however it is important to keep in mind that it is “only” low risk. Truthfully, I can see how if you lack discipline and start betting erratically there may be an increased risk. Generally, though, there are a large enough number of decent bets available each day that you shouldn’t find yourself in this position. Everything about this introductory aspect of Advantage Play Secrets has been geared towards those who are starting off and this doesn’t just show, but it is appreciated. It is clear that there are some decent returns to be made (Mike Cruickshank logged a profit of 27% on just one bet) and you really don’t need a lot to get things started. Even the software that you use in order to calculate everything is deceptively simple. Putting all of my cards on the table, I would go as far as to say with the exception of a very small handful of other betting methods, The Golden Parachute Method is one of the strongest beginners betting strategies I have ever looked at. There are a number of reasons for this, and they are points I have raised before, but they bear repeating. Advantage Play Secrets is low risk, simple and doesn’t require a substantial betting bank to get started. These are ideal conditions for those at the beginning of their betting journey. As the name of this particular aspect of Advantage Play Secrets implies, this method is a dutching strategy. Like The Golden Parachute Method, the focus here is very much on minimising risk whilst also maximising profit. Where the previous method is based more on volume of bets, the Dutching Bounty Method can generate much higher profits on a “per race” basis, however there is a notable dropping off in the number of races that you will be able to identify. Once again, I won’t go into too much detail about The Dutching Bounty Method as I don’t believe that it is fair to Mike Cruickshank to have his system available in the public domain. Essentially you are looking for certain dutching opportunities to appear on a very specific betting market. The first thing that you have to do however is find a race. There is a very clear indicator as to which races do and don’t fit the criteria for The Dutching Bounty Method which goes a long way to keeping things simple. As with almost all aspects of Advantage Play Secrets, there is a full calculator which is included for use with The Dutching Bounty Method. When you have found a race, the next thing that you need to do is to identify what the best possible stakes are. This may sound like an odd statement to make (surely more is better right? ), however there is a very strong balance between the risk and reward. Fortunately, The Dutching Bounty Method calculator comes with a “simulator” which shows the potential profits and losses from your bets. By consulting this, you can place the correct bet. There are also options to further boost your profits and further minimise that risk. Truth be told, there isn’t a lot more that I can say about this aspect of Advantage Play Secrets without giving it away. What I can say is that whilst you won’t necessarily be finding races every day with this, there is a lot of potential for big profits. This isn’t however an entirely risk free betting strategy, something that Mike Cruickshank is open about and actually provides examples of where it can go wrong (a very sure indicator of how consistently The Dutching Bounty Method actually works in my eyes). All of that having been said, the losses that you face might be at most £10-12 compared to realistic profits of £50 plus per bet. From a purely mathematical point of view, this represents a very good opportunity. Especially given the fact that the losses themselves are actually unlikely to occur as they rely on very specific outcomes. Acca Booster is one element of Advantage Play Secrets that doesn’t come without risk. In fact, I think that it is fair to say that you will lose a lot using this method, however, there is something at work here that means that it isn’t a system that should be dismissed out of hand. In fact, I think that it is reasonable to say that it is one of the more interesting betting strategies that I have looked at recently. As the name suggests, Acca Booster is all about betting on accumulator bets. More importantly, it involves finding examples that have been “boosted” by bookmakers that also have value. By using a strategy which I won’t divulge for obvious reasons, Acca Boosters is very good at identifying value accumulators, something which Mike Cruickshank has provided a number of videos that show you want to do. Acca Booster is a bit of a dark horse, especially when compared with the other products that make up Advantage Play Secrets. It is also one that I am least sold on. Because of how Acca Booster works, Mike Cruickshank says that the law of big numbers means that you will eventually profit if you follow the rules of finding value accumulators (so much so that Mike Cruickshank recommends that you record results over at least 250 times. This means that you have to have a lot of discipline and the patience to manage your betting bank over the long term. It also means keeping staking don to a minimum. In fact, Mike Cruickshank says that you should only stake between 0.25 and 0.5 on any one Acca Booster bet. This highlights to me just how strong the possibility can be for things to go wrong, particularly in the shorter term. 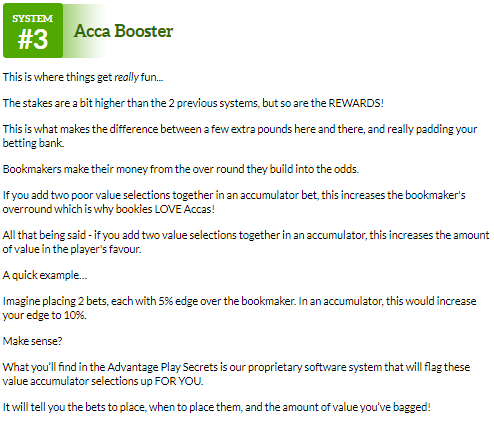 As with the other systems that make up Advantage Play Secrets, there is a piece of software which will help you to identify when Acca Booster bets are available. This is incredibly easy to use which is by far and away one of the strongest points for me. Bettors Exploit involves as I would have a very difficult job trying to convince you it can work otherwise. I also have to credit Mike Cruickshank for turning one aspect of his betting industry into yet another way that you can find value and as a result, decent profits. 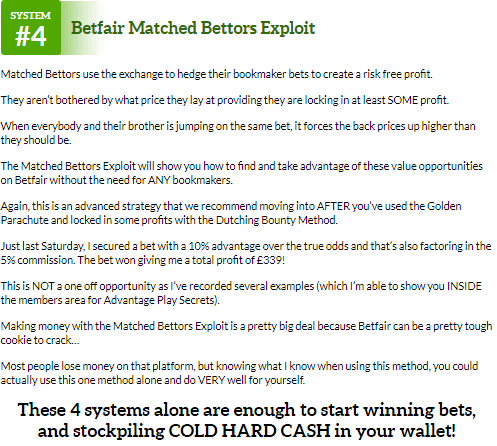 Essentially, Betfair Matched Bettors Exploit does exactly what it says on the tin. 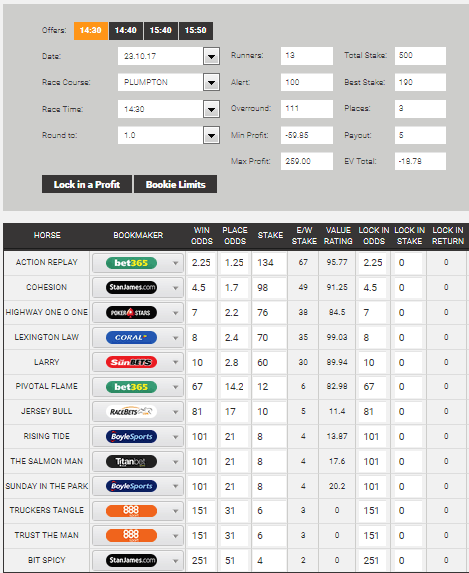 It exploits Betfair matched bettors. Because matched bettors are only interested in using betting exchanges to hedge their bets, this can be in turn leveraged to find value in backing these same bets. This is not a straight forward method however and I would even be inclined to say that it is the riskiest method of betting included in Advantage Play Secrets. Truthfully, this particular method definitely isn’t going to suit everybody and it is a far cry from what I was expecting coming into Advantage Play Secrets. This doesn’t however mean that it is a bad strategy. Truth be told, it is a fantastic way of identifying value bets quickly and easily. If you are comfortable being in the red for extended periods of time and are content to keep a long term approach to betting, then Betfair Matched Bettors Exploit will likely turn you a profit. You may well just have to wait for it. As you can see it is quite a simplified log in area, but that is what Mike Cruickshank does – he makes it simple. There is no point is over-complicating such things, because what is really important is learning how to make a profit. Where required, there is software assicated with each of the 4 areas (as described in this review), and Mike is the ‘Don’ of software products, so rest assured that the software you need to be able to work out your trades is all valid, present and correct. So What Do I Think of Advantage Play Secrets as a Package? I am actually rather surprised by the content of Advantage Play Secrets as an overall package. If I am completely honest, Mike Cruickshank has thrown in a number of approaches that I wasn’t expecting given his track record. This doesn’t mean that it is bad however; it is just different. I will try to get into detail to explain what this means below, but for now, I will say I am a little bit on the fence about Advantage Play Secrets. The reasoning for this is perhaps down to my own prejudice more than anything else. There are certain things that you expect from the Mike Cruickshank brand and frankly, only half of Advantage Play Secrets delivers on this. Where I think it is important to be up front about this is precisely because of the kind of thing that people associate with Mike Cruickshank. The truth is that on a long enough time scale, I believe that all aspects of Advantage Play Secrets will prove profitable. The Acca Boosters and the Betfair Matched Bettors Exploit use some pretty sound principles for identifying value. The thing about value based betting is that when it is done properly (as Mike Cruickshank has), it will eventually turn good. The Golden Parachute Method and The Dutching Bounty Method are both much more in line with what I was expecting. These produce decent yields with low risk. Really, I would say that Advantage Play Secrets is the start of moving into more intermediate betting strategies. Mike Cruickshank has a clear approach to his products with each generally leading into one or another in a roundabout fashion. In Advantage Play Secrets I feel like the last vestiges of low risk betting have likely been plundered and this means that inevitably, things have to change. This change is what makes for intermediate betting. I cannot stress enough how difficult it can be to manage a betting bank and keep a long term approach to betting. This is in part because I think most people simply don’t have the financial freedom to make their money make money for them. Of course, Mike’s earlier products can definitely help you with that and if you are new to his work, go pick up those before you look at Advantage Play Secrets. The truth is that it takes a certain resilience to watch yourself losing money week on week and a lot of people don’t have that. In fact, this is one area where I would have really liked to have seen more from Mike Cruickshank. He has been in this game for years and I know that he has written about the topic before now. Something that reassures you about a long term and value based approach is sorely needed given the Acca Booster and Betfair Matched Betting Exploit strategies. It might sound like I’ve been giving Advantage Play Secrets a bit of a hard time so far and to some degree this is true. As a reviewer, it is my job to point out the good and bad of a service. The fact is that despite these negatives, there is a lot to Advantage Play Secrets that is more than worthwhile. I just think that you have to be aware of exactly what you are getting when you sign up to the service. If you can keep what I have already said in mind and are able to take the correct approach to Advantage Play Secrets I actually think this is a decent product. It is definitely not what I was expecting from Mike Cruickshank but I don’t think that this move is a bad thing. The fact is that there is only so much you can do around matched betting and low risk betting before you have to look elsewhere. There are a number of directions that you can go, but I think that finding quantifiable value and using that as a basis isn’t terrible. Does Advantage Play Secrets Represent Value for Money? This is a bit of tricky question as it very much depends on who you are and where you are in your betting career. If you are starting out or are still using some of the more basic matched betting techniques that Mike Cruickshank has developed, then you are going to struggle with Advantage Play Secrets. As such, it isn’t really worth paying anything out; never mind the cost of Advantage Play Secrets. If however you are looking for the next logical step from matched betting, then Advantage Play Secrets is a solid option. Obviously all of this leads me on to the price. There is only one option which is available if you want to sign up for Advantage Play Secrets which is a single payment of £99 (plus VAT). As far as I am concerned, you are getting 4 very solid betting systems for £100 (after the £1 trial). This is definitely a fair price and more than in line with what you would pay for much lesser offerings. Yes it is quite a substantial initial outlay, however given that you only pay once I think it is justified. With that in mind, if you are able to handle the risks that come with Advantage Play Secrets, I think it represents excellent value for money. There are two ways of viewing Advantage Play Secrets. The first is in the same light as Mike Cruickshank’s previous offerings. In this regard, I think that it possibly pushes people’s expectations of what is on offer a little too much. Truthfully, most matched bettors and low risk bettors (which I feel it is safe to say make up most of Mike Cruickshank’s audience) are very unlikely to be happy with the risks that come from Acca Boosters and The Betfair Matched Bettors Exploit. It is important to discuss these risks as I feel they are perhaps more prominent that any aspect of Advantage Play Secrets really makes out. Looking at Acca Boosters, the fact that you need a minimum sample size of 250 bets is a hell of an ask. Even if you are only staking small amounts, this can still cause a fair amount of trouble for your betting bank. The second way of looking at Advantage Play Secrets is as a new chapter in Mike Cruickshank’s journey as a “betting guru” and this is the way that I want to look at it. I am quite certain that if you are reading this article, you have probably seen and heard some crap. I however practically eat, breathe and sleep it. As such, I know when there is something genuine and when somebody is trying to pull the wool over my eyes. Mike Cruickshank is definitely genuine. One look at the methods he employs for extracting value in bets tells me this. This makes Advantage Play Secrets a winner in my book, albeit not necessarily a typical example. There is a hell of a lot on offer and whilst there is risk in the systems, Mike Cruickshank has done a good job of minimising it as much as you can expect. The fact is that really, the only real risk that I could perceive is the costs but with the trial and the money back period this is negated. Would I rush out to buy Advantage Play Secrets? If I were serious about building a long term betting system portfolio then absolutely. If however you are looking for something shorter term or that will turn around a quicker profit, I would look at Mike’s more “traditional” products, as we have reviewed many times on this website. Now that Advantage Play Secrets has been launched a few weeks, more and more people are emailing in to report their profits, as well as documenting their profits on Mike’s Facebook page. As you can see, these are excellent profits being made. The above profits were made with just one aspect of the whole series of products, these profits were made using the Golden Parachute method that is included. Hello Sam, most people make a hell of a lot of money before they have all their accounts closed, Mike has some members £50K+ on his Facebook group. To answer your question though, the Betfair Matched Bettors Exploit in this particular product is based around Betfair only. Hello Pravin. It is a decent question, but I think even in matched betting there are no risk free elements other than following strategies that are known to work, and following more of these strategies that work than those that don’t. That’s the trick with gambling methods. Many of them work, and many of them don’t but what you have to do is find sound principles that place the law of averages strongly in your favour. Following anything blindly will lead to losses, and this is also the same for matched betting, it is just that matched betting is easier to follow hence why we always review Mike Cruickshank’s products because what he does is place the ball firmly in the user’s court regarding making a profit. Hello, the review has now been updated with some of the feedback by customers to Advantage Play Secrets. 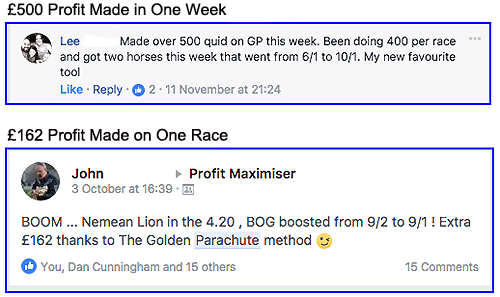 One customer made £500 in a week, with another who made £162 on a single race, showing opportunities to be had with this product.